AT RUSH. Tickets may be available at showtime. All advance online tickets for this show have now sold out. "Rush" tickets may be available at the venue 15 minutes before showtime. To us it may be a radioactive "Exclusion Zone" to them it's their ancestral homeland. In this remarkable tale, a defiant community of women scratch out an existence on Chernobyl's toxic land. 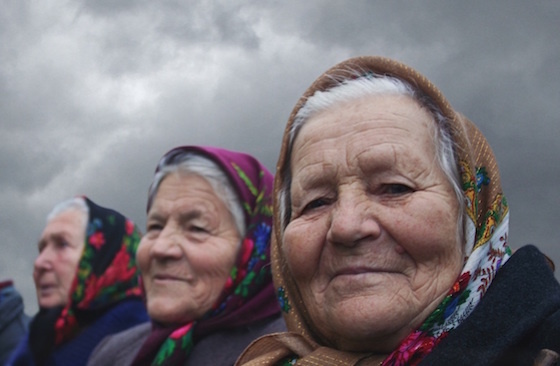 Thirty years since the Chernobyl disaster, the women's stories show the healing power of shaping one's destiny and the subjective nature of risk. Like the wolves, moose, wild boar and other wildlife not seen for decades that have come back to the abandoned forests around Chernobyl, the women of the Exclusion Zone, have an extraordinary story of survival, and offer a dark yet strangely uplifting portrait of life post-apocalypse. DISCUSSION WITH: Japhet Weeks, cinematographer; Steve Michelson, The Video Project. Holly Morris explores the lives of women around the globe through her collection of films in the Adventure Diva series - broadcast on PBS and internationally. Anne Bogart has produced/directed programming for a variety of broadcasters, and has written for many media outlets including, The New York Times. Both Morris and Bogart have been longtime presenters for the PBS series, Globe Trekker.